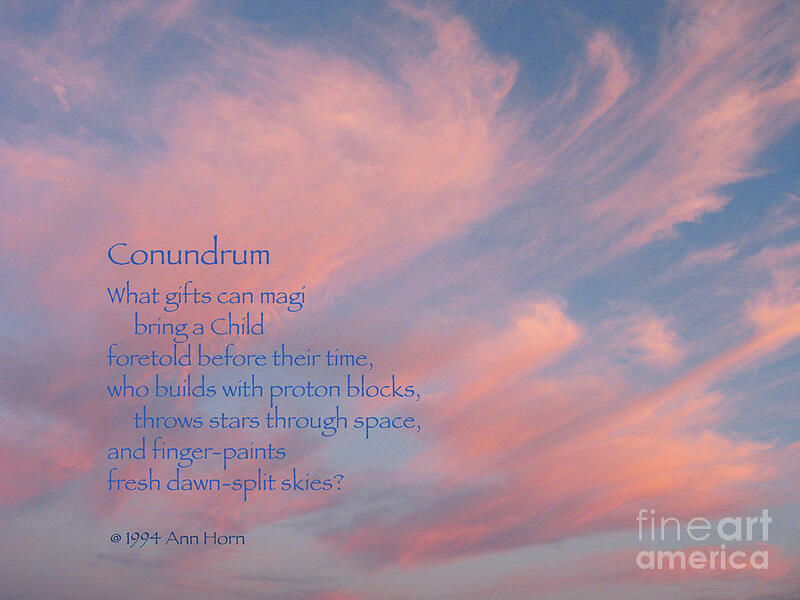 Conundrum is a photograph by Ann Horn which was uploaded on August 9th, 2009. This poem, illustrated by the photo of the sky and sunlit clouds, is suitable to send as a Christmas card. Together the poem Conundrum, copyright 1994 Ann Horn, and the photo Conundrum, copyright 2006 Ann Horn, carry the copyright Conundrum 2008 Ann Horn. None belong to the public domain and may not be reproduced, copied, altered or manipulated in any way without the written permission of Ann Horn. ann-horn.pixels.com. 2nd place in Sky messages contest, 10/1/14. Catholic Art Gallery. Wonderful Greeting Cards. 500 And Beyond Fine Art. 500 Views. Christian Theme Artwork. Clouds Always the same but never the samE. 3 A Day Cards For All Occasions. Loving the Color PURPLE and PINK. Frank, thank you for featuring Conundrum in the Catholic Art Gallery. Your gracious response is much appreciated, John. Thank you. Splendid combination of poem and image. Johanna, thank you for featuring Conundrum in the Wonderful Greeting Cards group. Congratulations! Your wonderful art with text is featured in the Wonderful Greeting Cards group. LF. Beth, thank you for featuring Conundrum in the 500 And Beyond Fine Art group. Many thanks for your gracious response, Debbie. Mariola, thank you for featuring Conundrum in the 500 Views - 1 Image a Day group. Geordie, thank you for featuring Conundrum in the Christian Theme Artwork Group. Many thanks for your words of congratulations, Patricia. Very much appreciated. Congrats on your contest win, Ann. This is such a lovely image and wonderful poem! Nick, thank you for featuring Conundrum in the the CLOUDS Always the same but never the samE group. ... and the Magi's gift of love was The Child's love returned, expressed by their most valued possessions, which was the best they had to give. Thank you, Frank, for your gracious and thoughtful response. What a Beautiful image Ann! Your lovely poem raises a timely question : what was the gift of the Magi? Love, I have always thought, the gift was love. Jordan, many thanks for your kind comment and for featuring Conundrum in the Cards For All Occasions group. jrr, many thanks for featuring Condundrum in the Loving the Colors PURPLE and PINK group. Darren, many thanks for featuring Conundrum in the 3 A Day Greeting Cards for All Occasions group. Thanks so much for your gracious and encouraging comment, Diana. Thank you, Sharon, for your affirmation of image and poetry. They seem to me a good match.